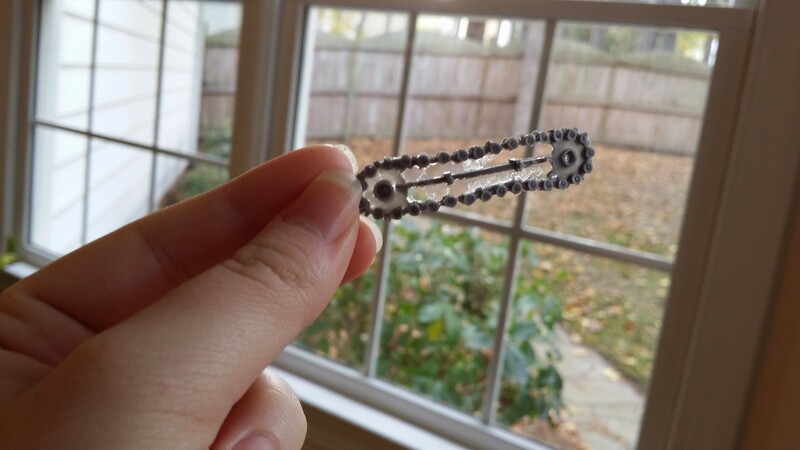 This model was actually pretty fun, aside from the fiddly wrist joint that really needs careful pinning. The skin/scales was first painted RMS Peacock Green. 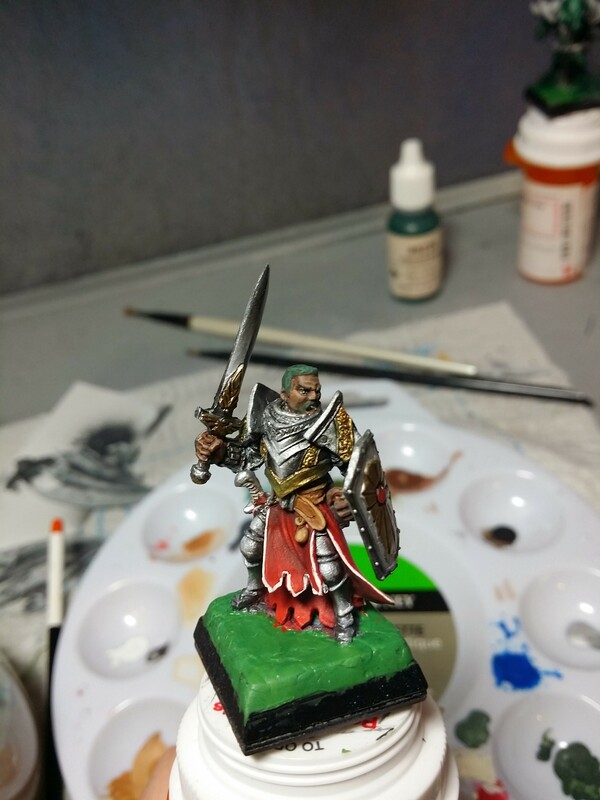 Next, it was drybrushed RMS Olive Skin Shadow. 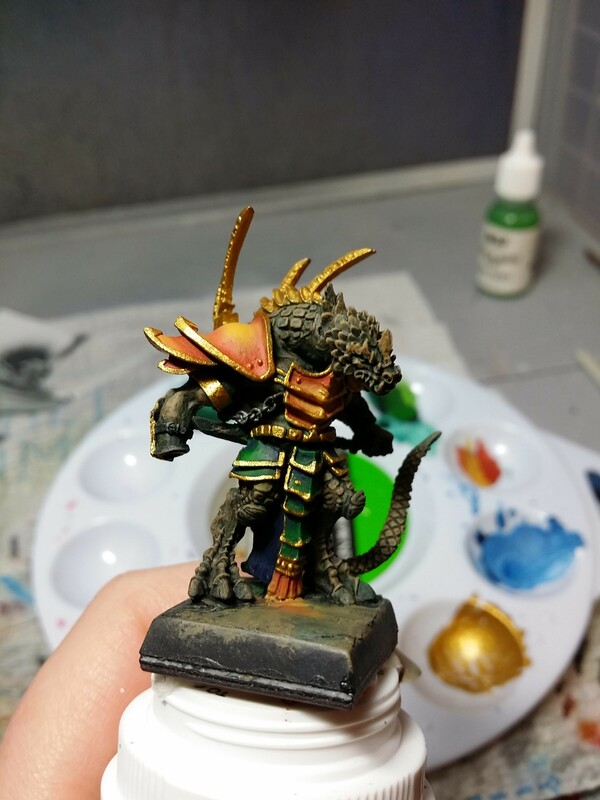 The goal was for the skin/scales to have a bronze-like appearance per the character description given to me. 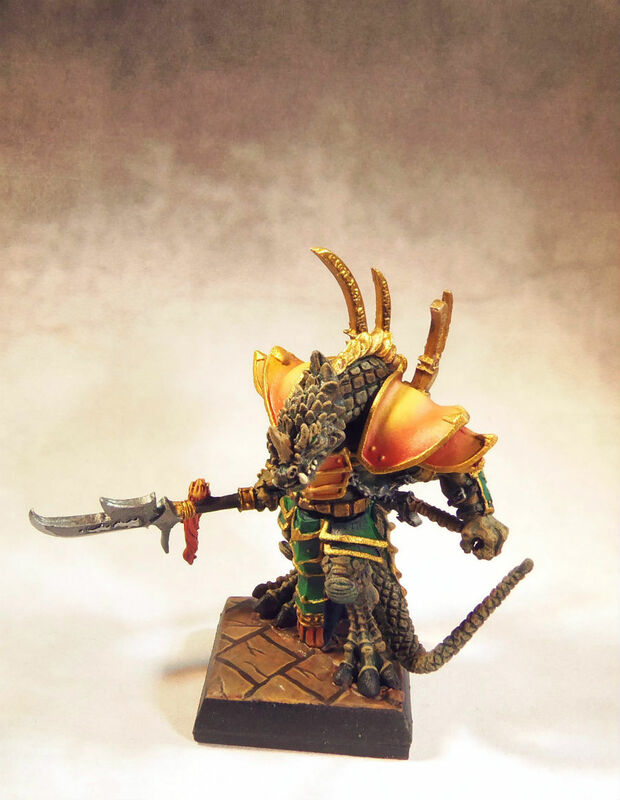 This model is to be used as a D&D character. 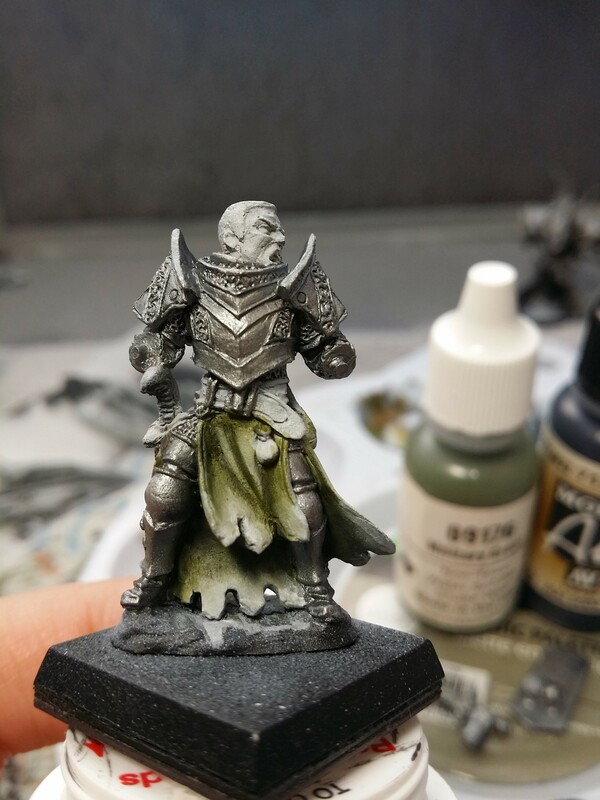 After that it was washed with thinned RMS Peacock Green, drybrushed RMS Stormy Grey, drybrushed again with Olive Skin Shadow, and drybrushed to highlight with RMS Olive Skin. 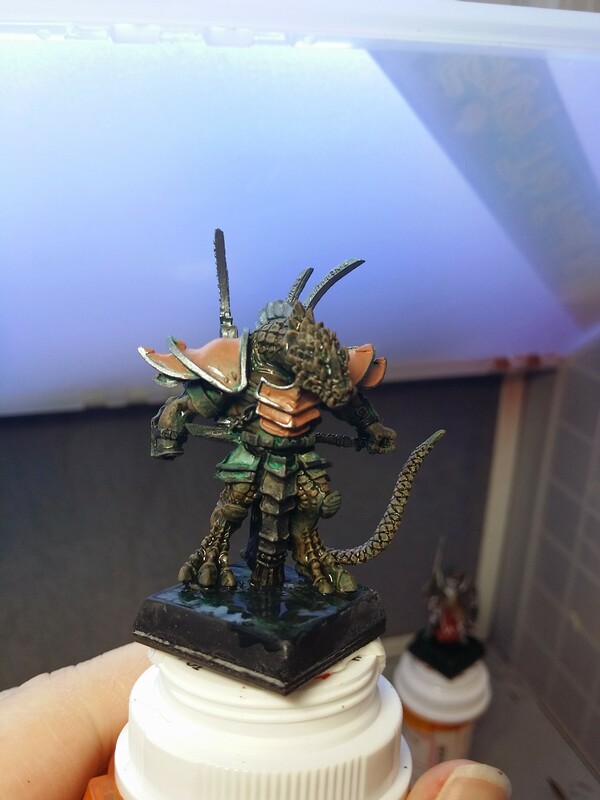 After that the skin was washed with GW Agrax Earthshade. 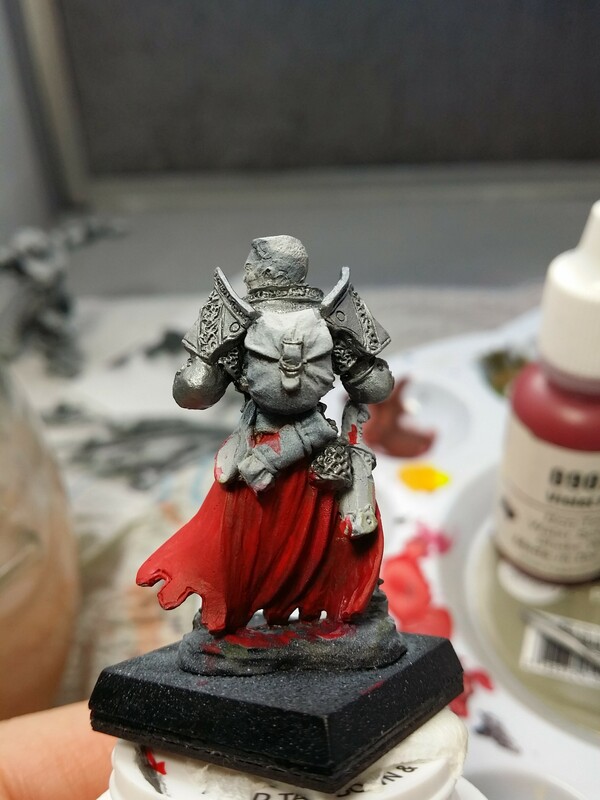 After that it was time for the armor. 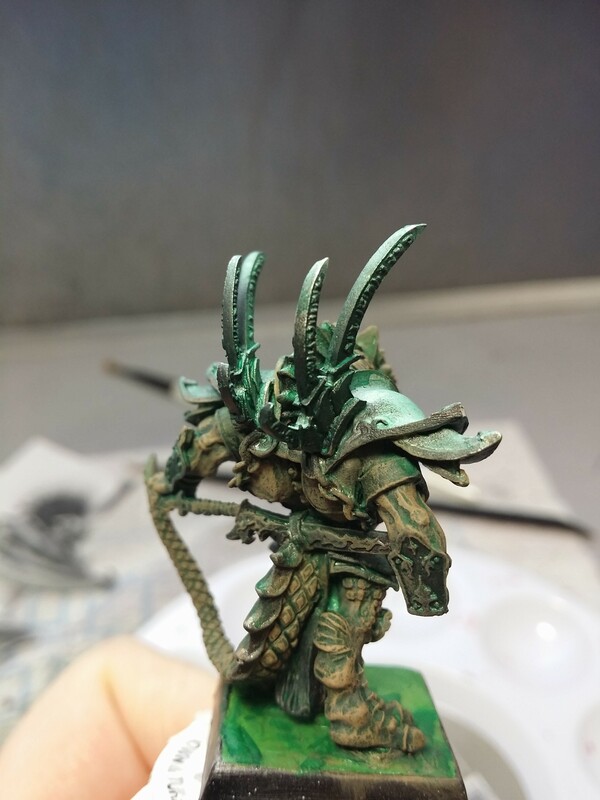 The upper armor areas were airbrushed first with RMS Rust Brown, and the highlighted with RMS Palomino Gold. 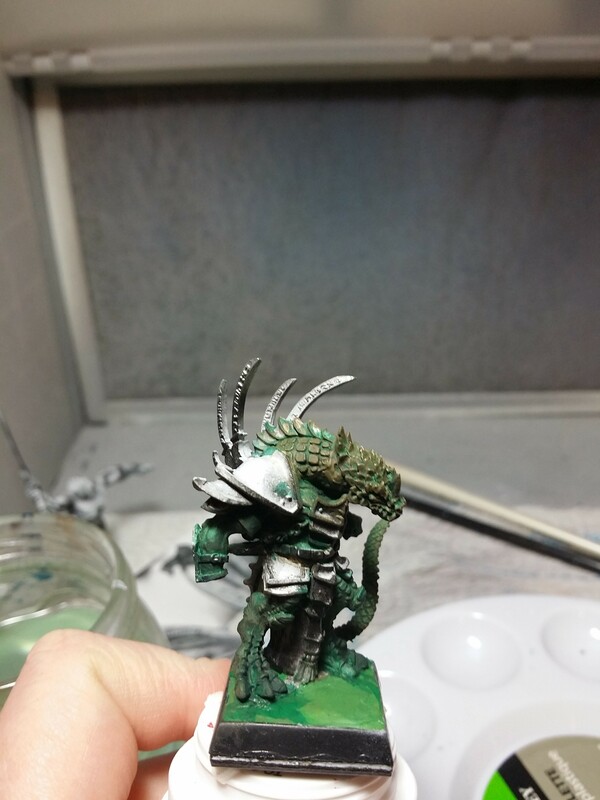 Next, the lower armor areas were airbrushed RMS Ritterlich Blue, then RMS Viper Green as a highlight. 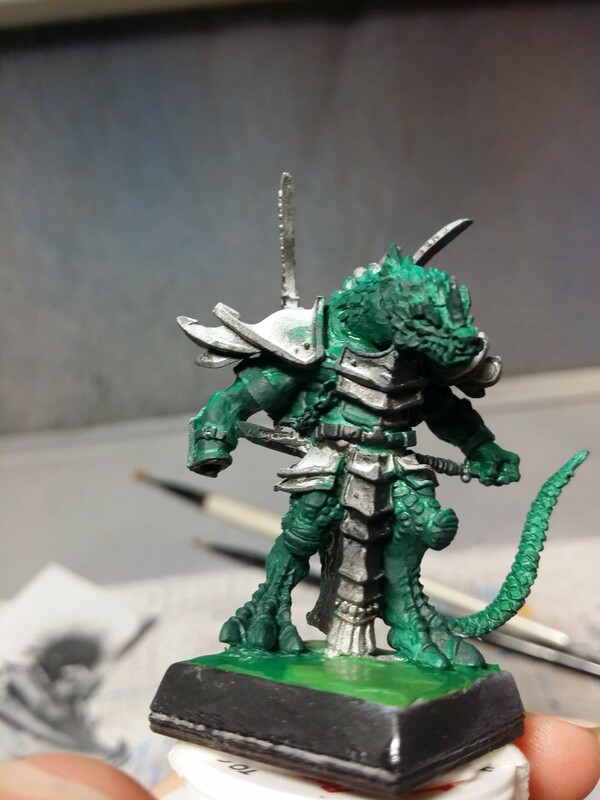 Then the armor edges, spikes, and back armor plates were painted VMC Brass. 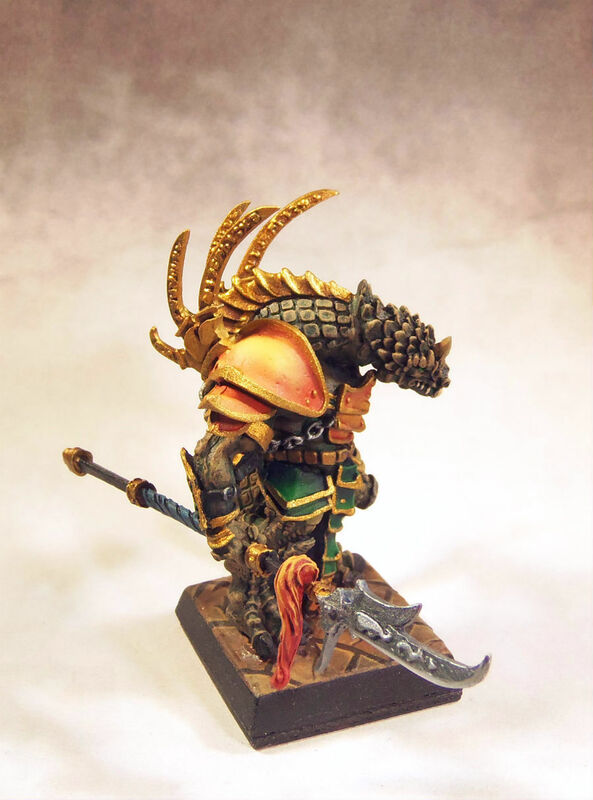 After that it was time to finish up details and paint his base. After that his arm was attached, and he was finished! 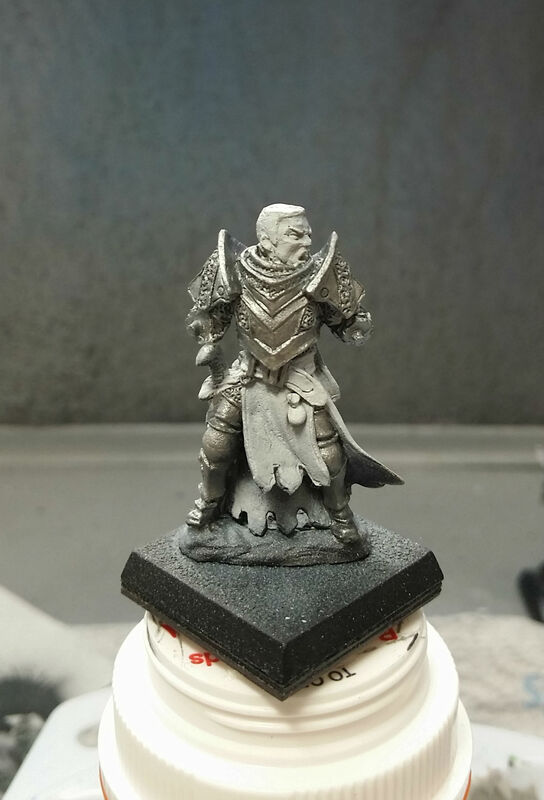 WIP: Reaper Dalton Krieg, Adventuring Knight cont. After my last post I did a lot more work on Dalton Krieg. 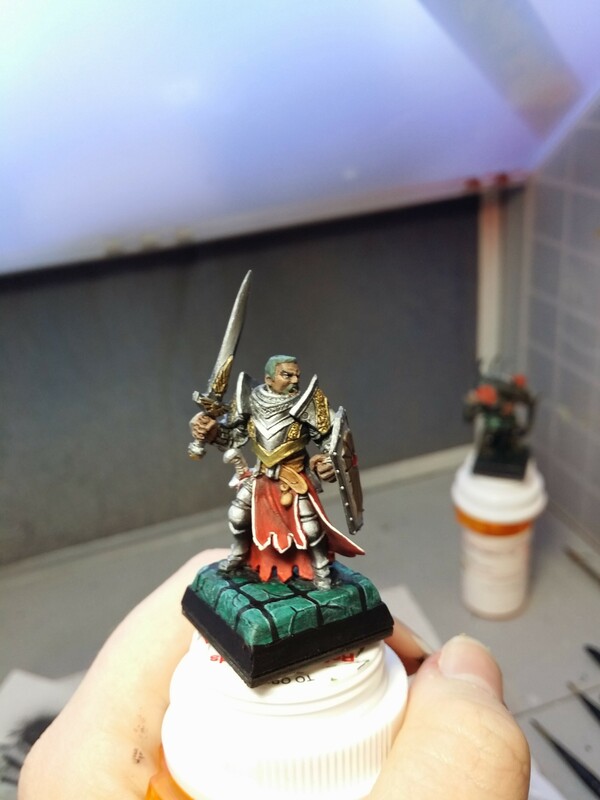 I finished the tunic, painted details per the character description I was given, and began a base. 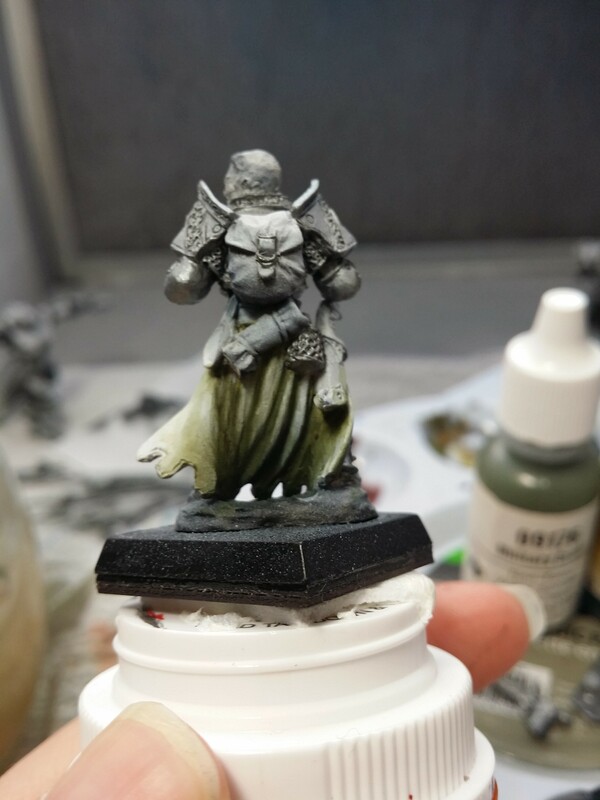 I built the base up with green stuff to the level of the rocky base he was cast with. I didn’t have to take much care to make it flat since it was going to be a stone floor. The texture could only work in my favor. 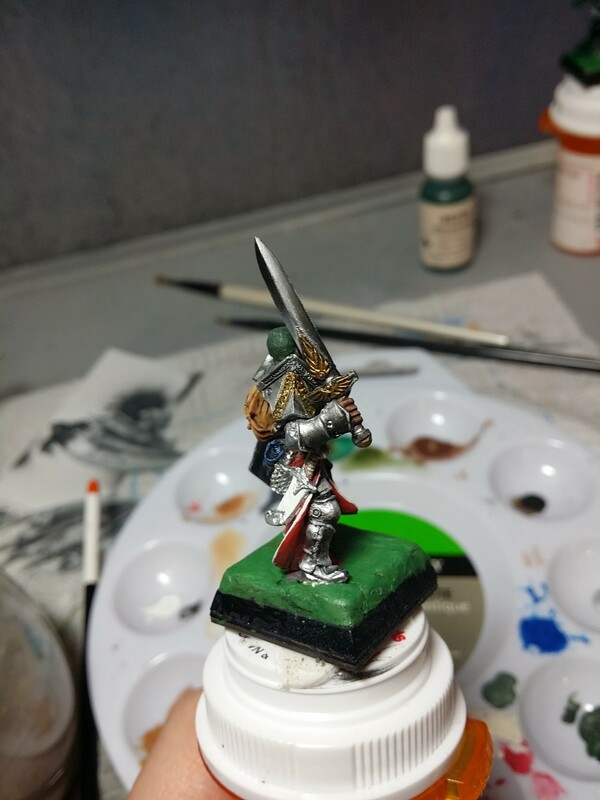 After the green stuff hardened I painted the base! 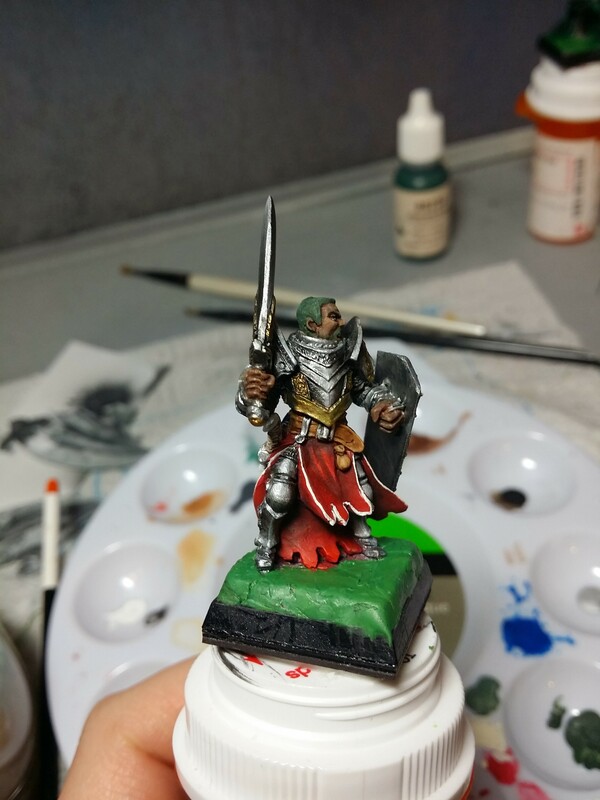 I recently painted a knight to be used as a D&D character – Reaper Dalton Krieg, Adventuring Knight. I really like this sculpt, although the cast had some issues on the face. 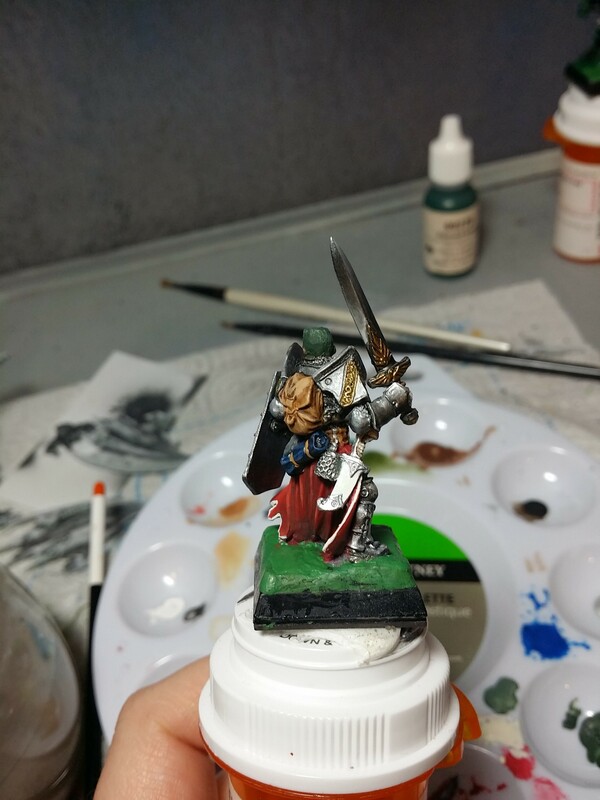 On this model I tried a new-to-me technique for shading and highlighting metallic paint. 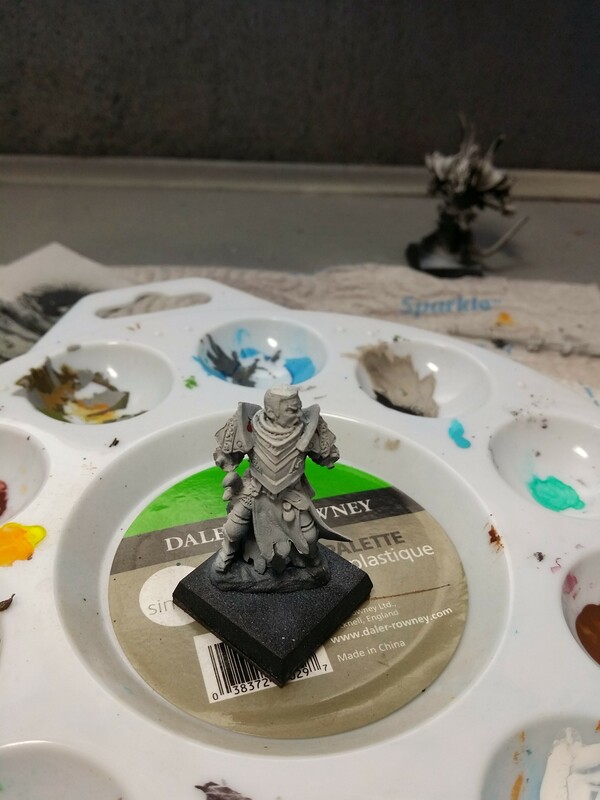 First, the model was primed Vallejo Surface Primer Grey. 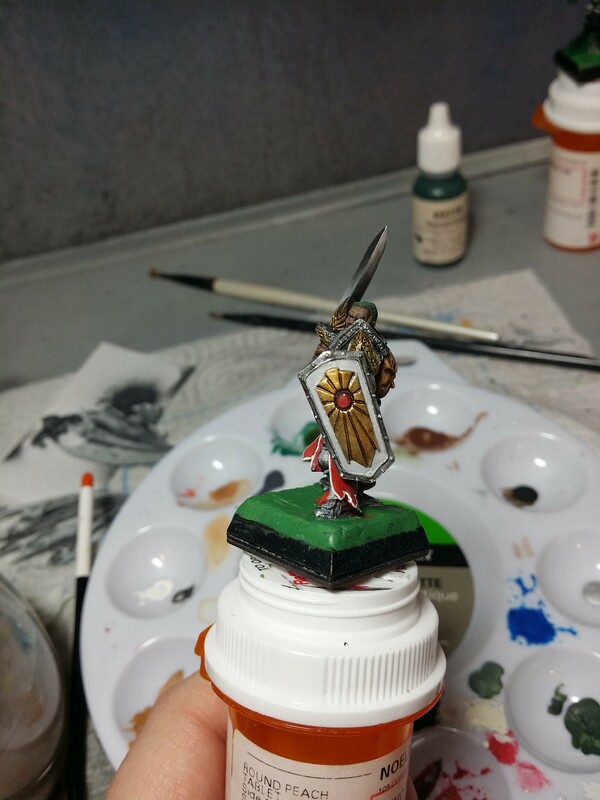 He was painted with the sword and shield separate. 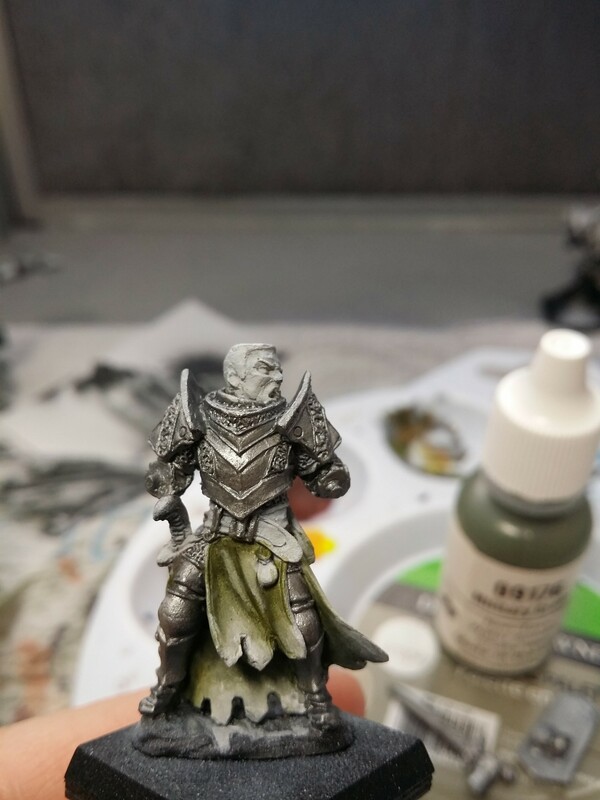 Next, I painted the armor with a basecoat of VMA Gungrey. 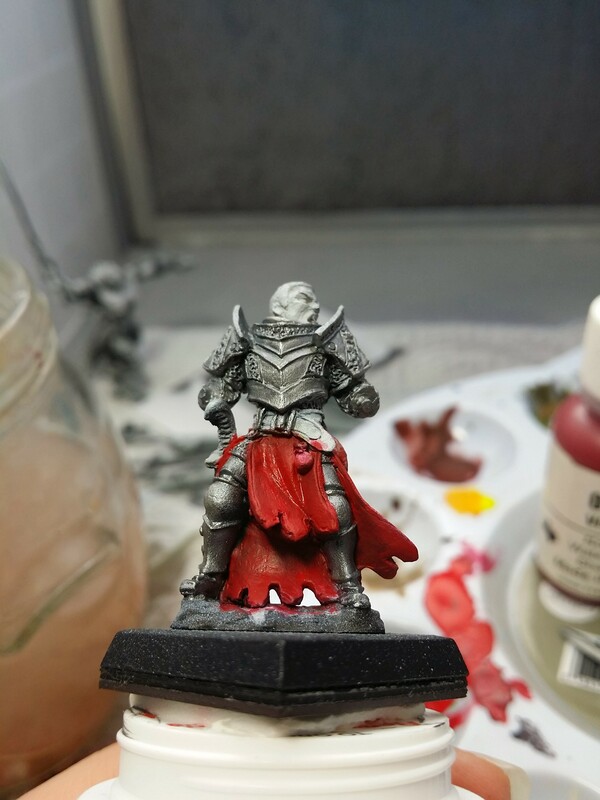 Next, I decided to use the verdaccio underpainting technique on the red tunic, and this time with greater care than before. First, I used RMS Military Green. 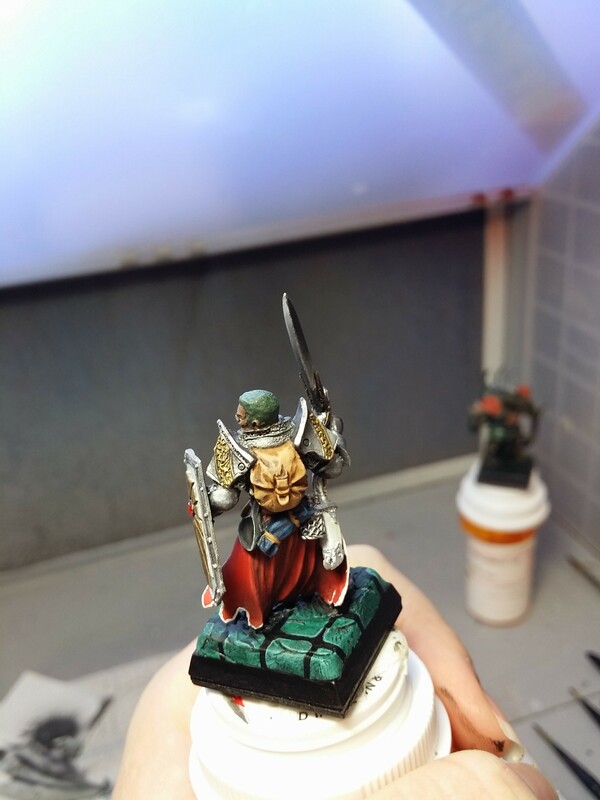 Next I added black to the Military Green to deepen the shadows. After the green undercoat was finished, I used a 1:1 mix of RMS Violet Red and VMC Carmine Red for the base red color. You can see how the shading of the red is already well-started. Next it came time for the armor! 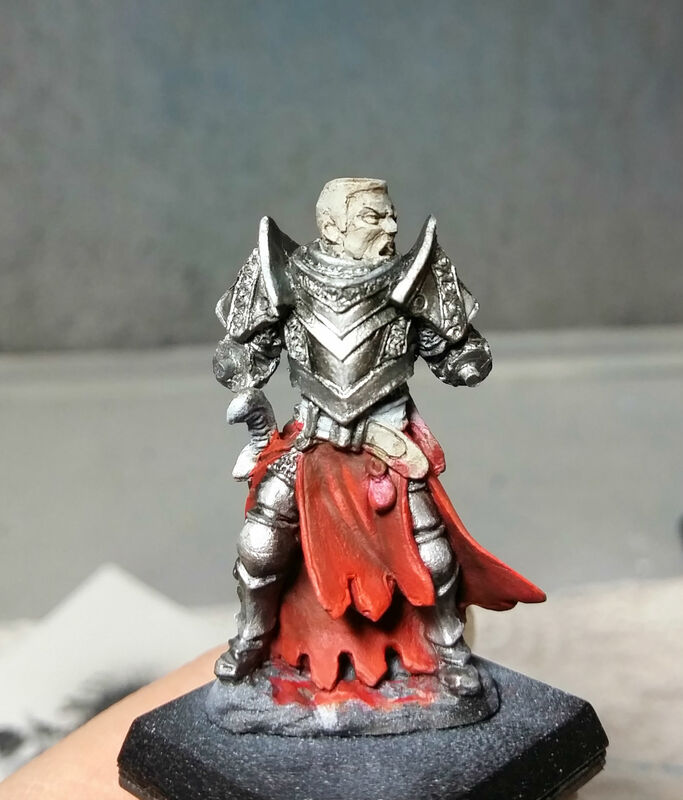 The new-to-me technique is really more of a way of looking at how to paint metals in general. 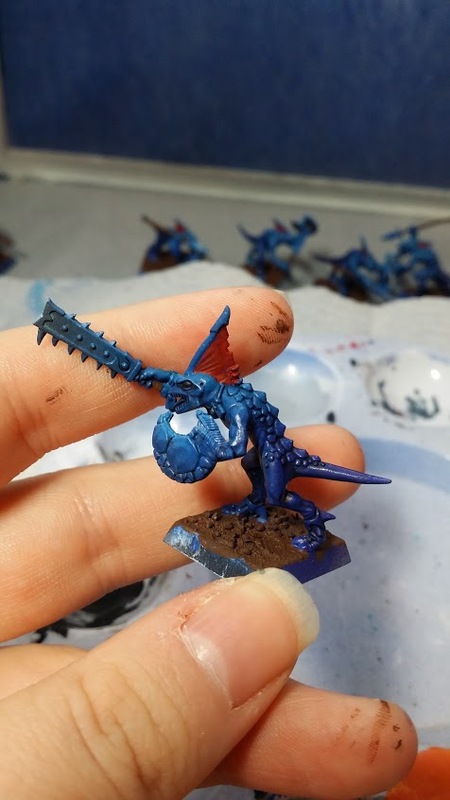 Basically, all metal is painted in a NMM technique whether you’re using regular paints or metallic paints. High contrast is extremely important, as is taking into consideration what the metal will reflect. You have to paint in all the darks and lights. 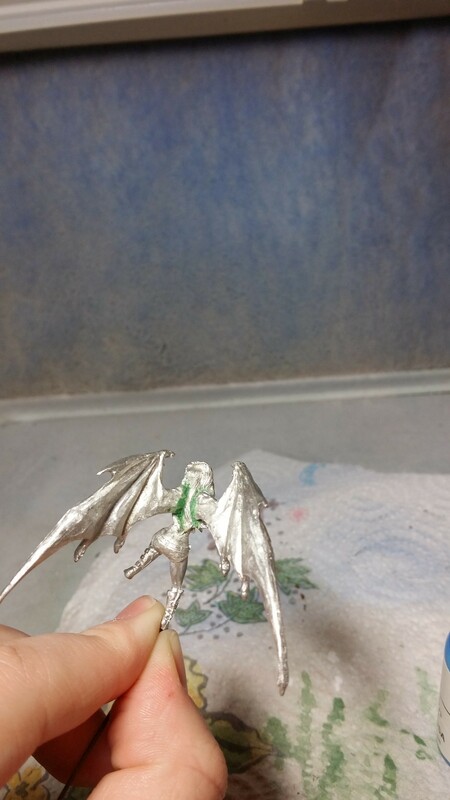 The metallic paint will not do all that on its own, and it’s not designed to. 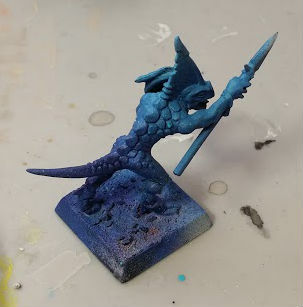 To that end, I shaded the VMA Gungrey with a very thin VMA Black (mixed something like 5 parts water to 1 part paint, maybe even a little thinner). 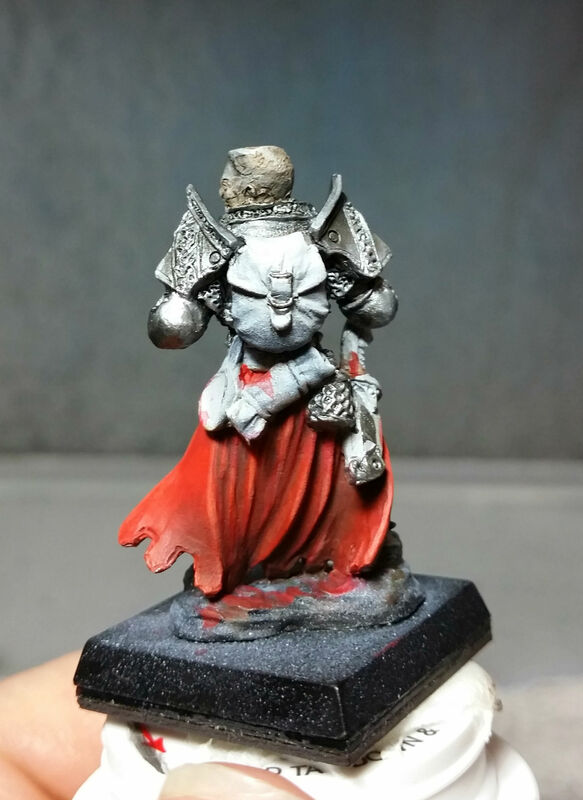 I highlighted first with a very thin VMA Aluminum, and then with a very thin VMA White. 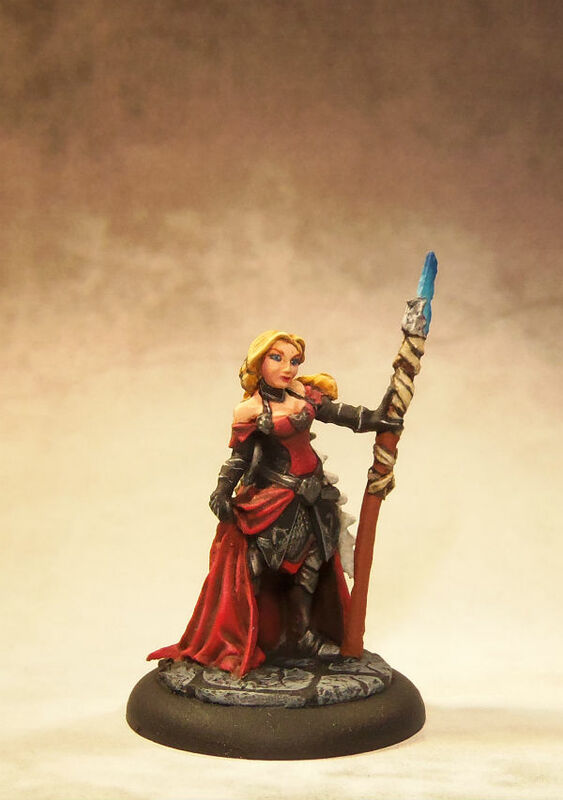 A while back I posted about painting Devona, but I never posted about finishing her base! The first thing I did was to level out her base with some green stuff. It didn’t have to be perfectly flat because she was going to be standing on stones. Next, I painted the base black, and then painted grey stonework onto it. Devona is currently for sale for $40. Contact me if you’re interested at MGMPaint@gmail.com. 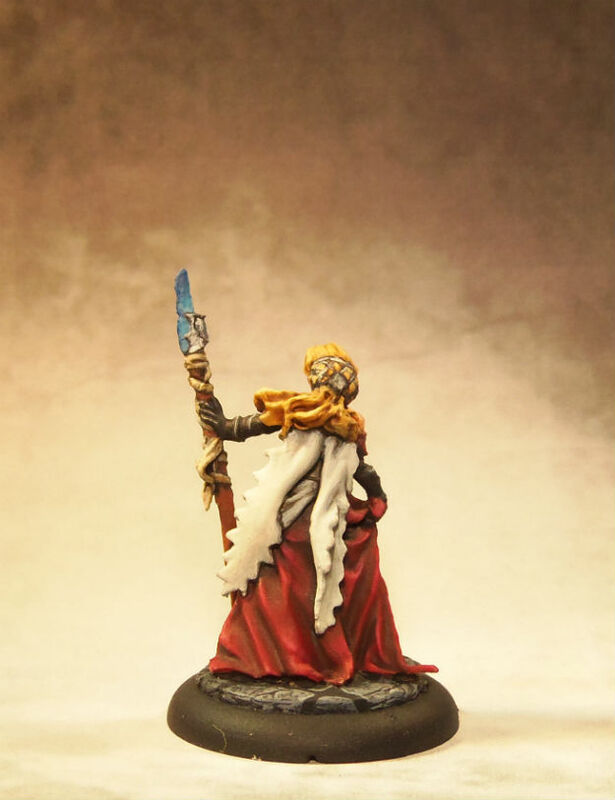 WIP: Reaper Kickstarter Sophie cont. I did more surface prep and assembly of Sophie. 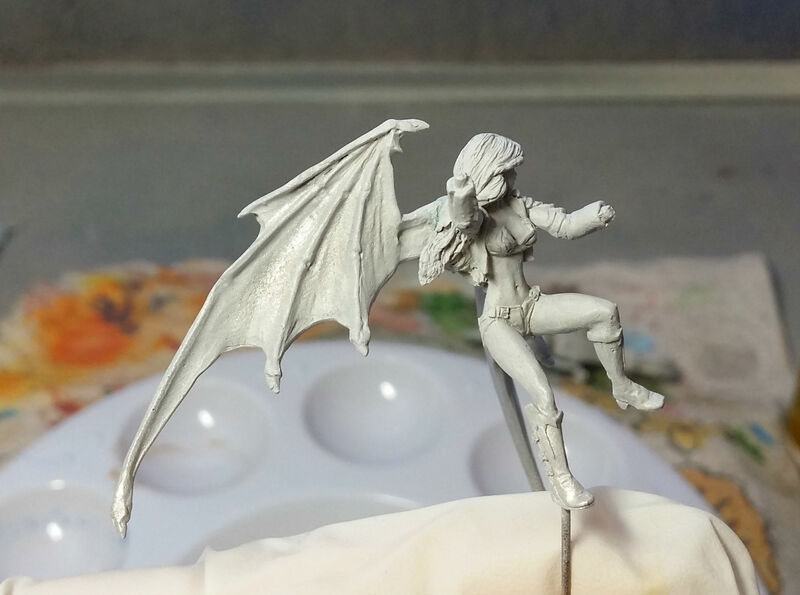 Then I finally got to prime her (with Vallejo grey surface primer as usual)! 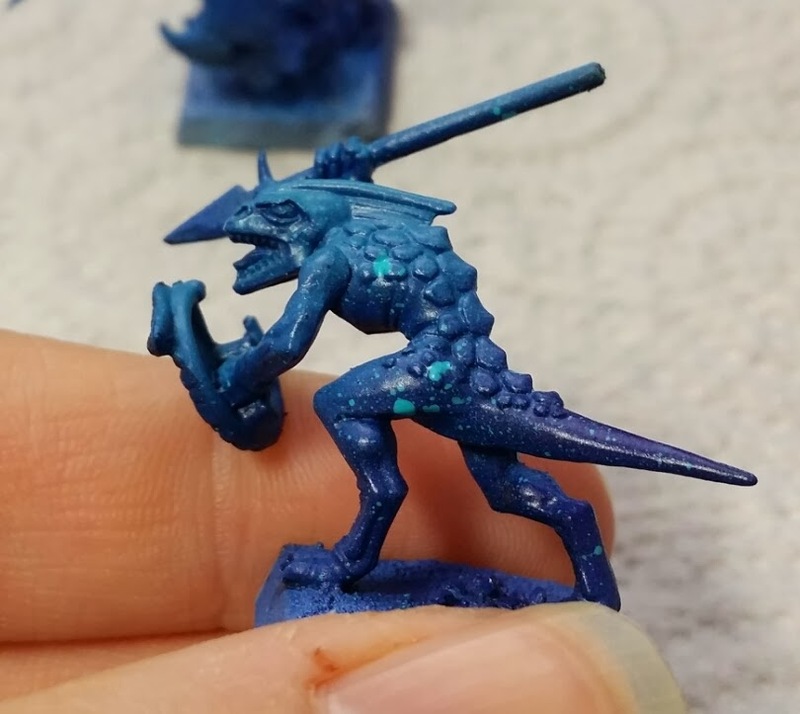 There are a ton of recast miniatures in circulation, and it seems that most people cannot tell the difference. 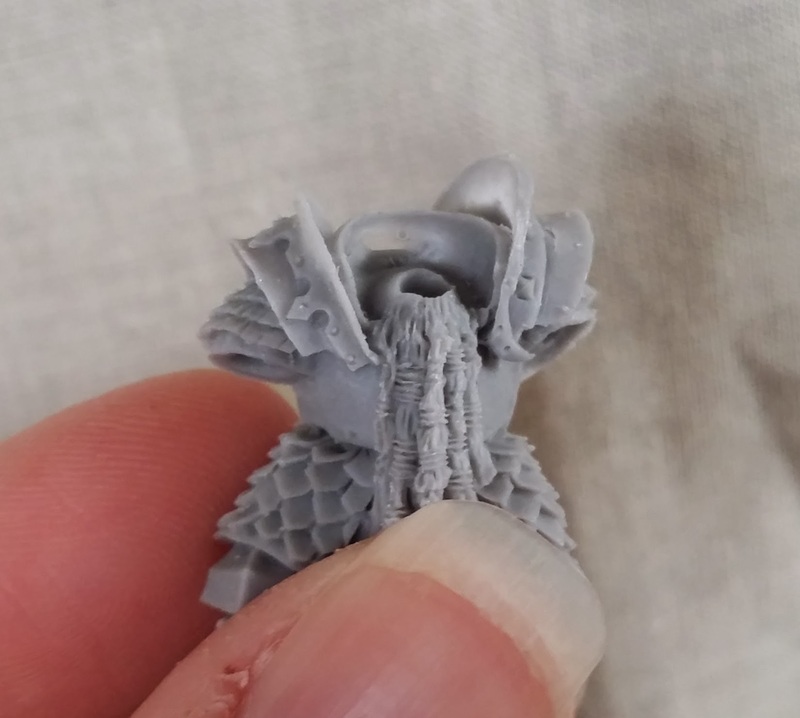 There just isn’t a lot of information out there about how to tell the difference, so I thought it would be a good idea for me to post about a few things to look for if you suspect you may be dealing with recasts. 1. When purchasing new models on eBay, the models come from Russia or China. 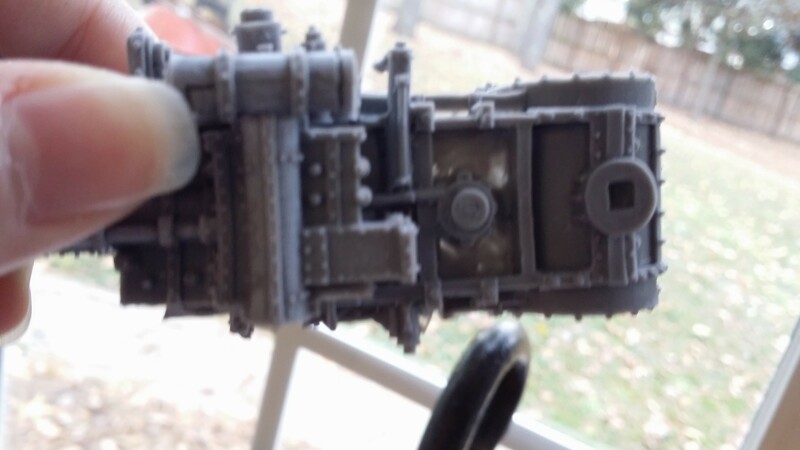 Although there certainly can be legitimate Forge World models currently located in these places that the current owner wants to liquidate, most of the time those will be used. 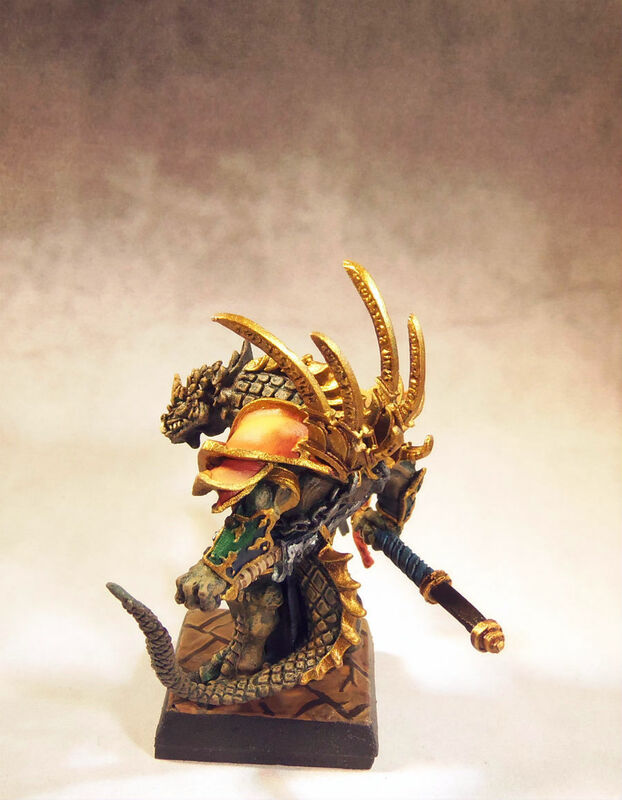 These countries have different laws regarding intellectual property, copyright, and counterfeiting, so Forge Word/Games Workshop has been unable to shut these re-casters down. 2. 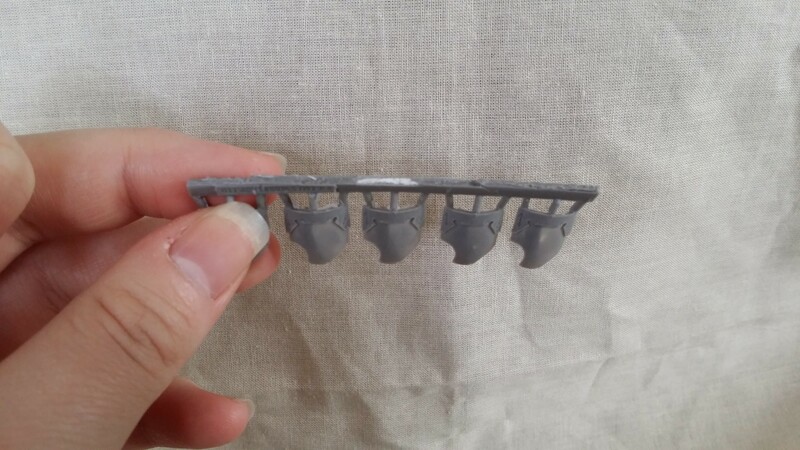 The way the models attach to the sprue could be a clue. 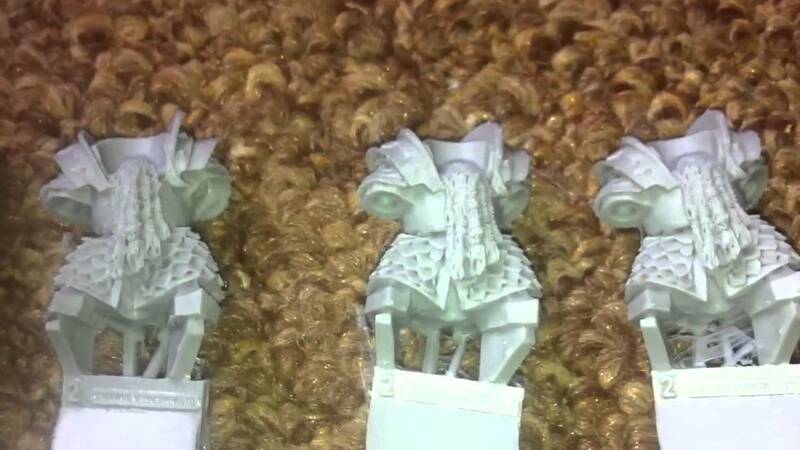 As an example, Forge World Chaos Dwarfs come on large triangle sprues. 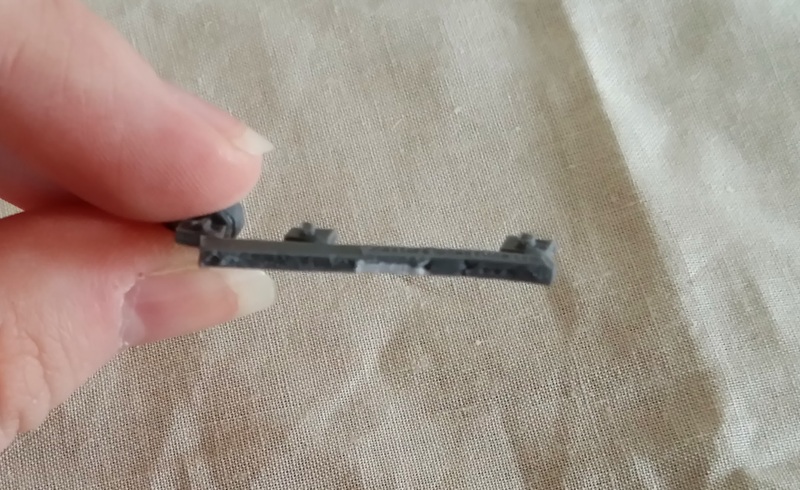 Here is a recast that appears that the original Forge World model used to make the mould was cut from the large triangle on the bottom of the sprue. This made the mould have a rough bottom from the cuts. 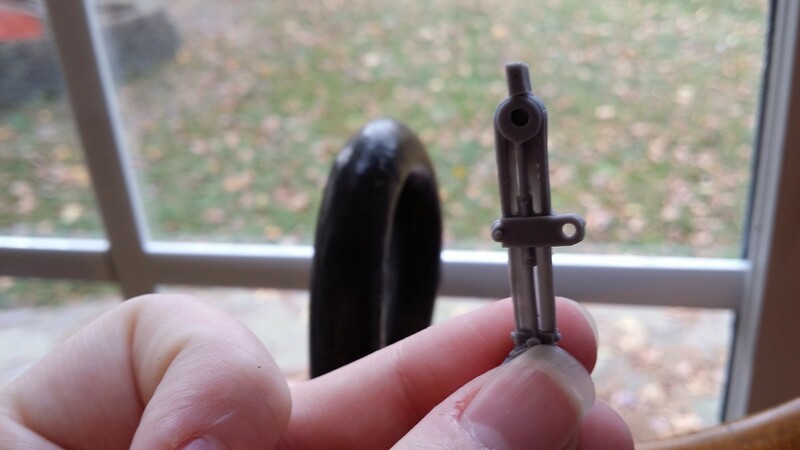 They put a gate on the middle of the original sprue, and then the recast model was cut there causing the white area in the middle. 3. 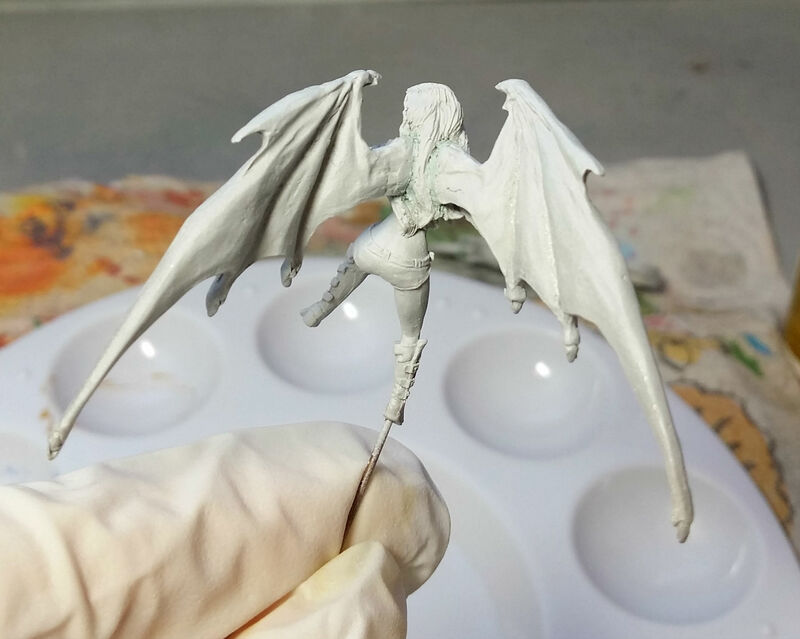 Thin casts is another sign of a re-cast model. This can often be seen in flat areas, faces, arms, and legs. 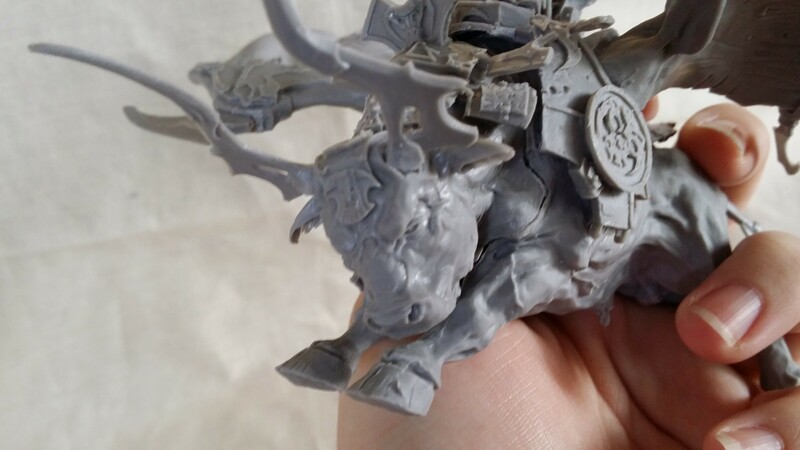 Although not pictured, the face of the rider on that model had extra thin features. His nose was just a thin line of resin, and his cheeks were malformed. Here is another example of a thin cast. The shoulders and necks are so thin they have holes in them. 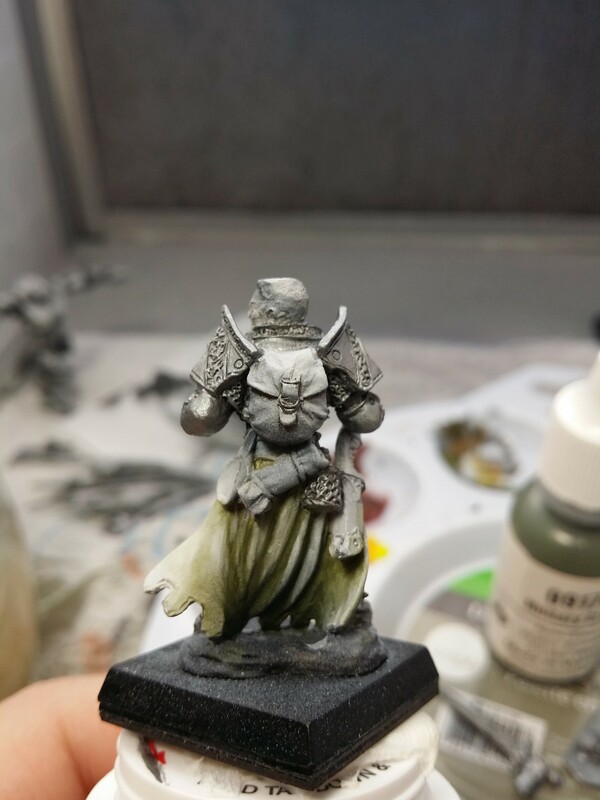 This model is actually supposed to have symbols on the inside of the shoulders, but the cast is too thin to preserve them. 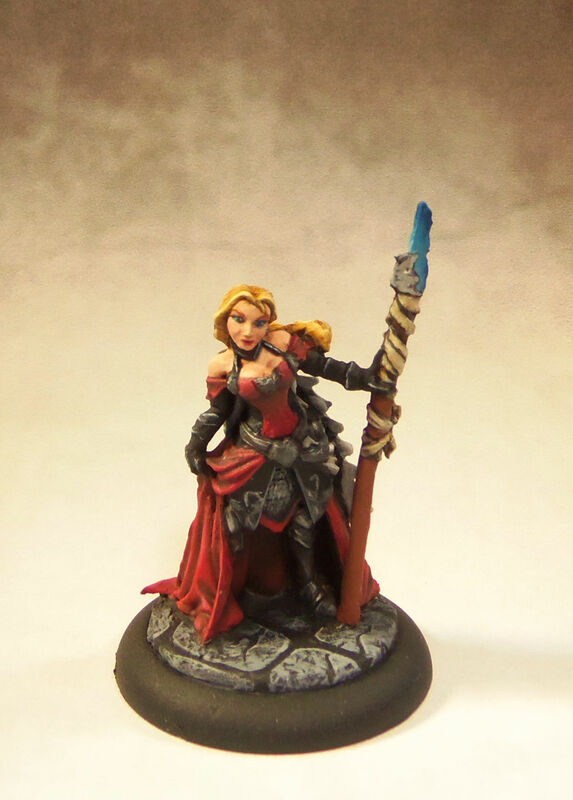 Here is a warmachine that is too thin on the bottom. 4. Miscasts beyond the norm are another indicator that the model is a forgery. On this model there is a weird texture on the bottom. You may find weird textures like this on the bottom, inside, etc. Here is a model missing some details, and other details are much softer than they should be. This bit has areas where the resin filled what should have been open space. 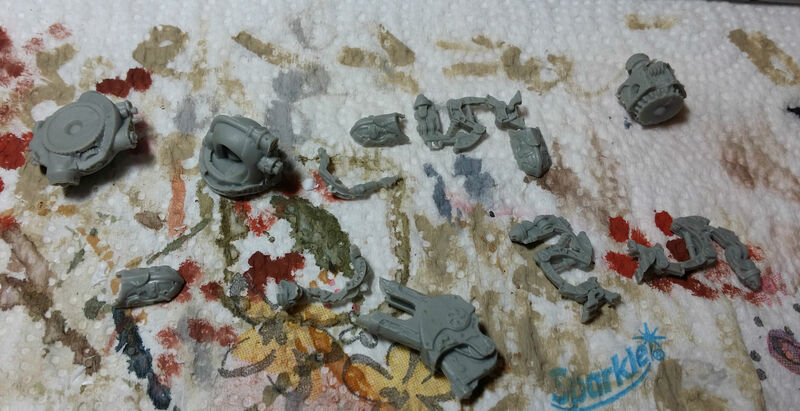 This type of miscast is common on recasts. This bit has a similar issue. 5. Double mold lines are also a giveaway for counterfeit models. 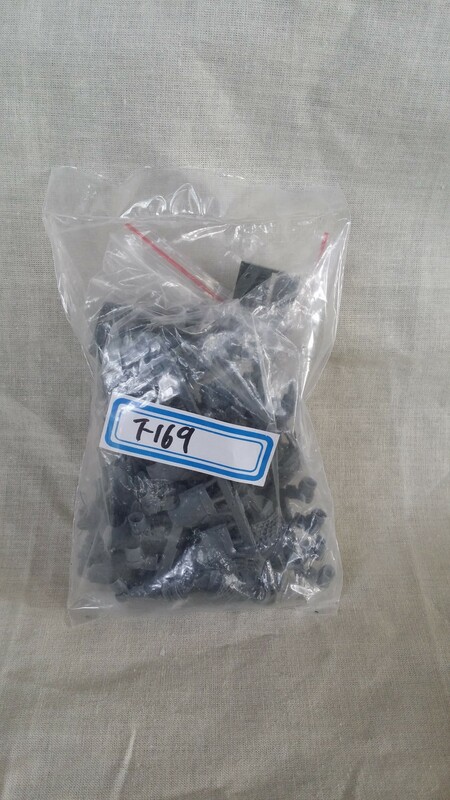 One mould line would be part of the mould from the original, and the other mould line would be from the casting process. 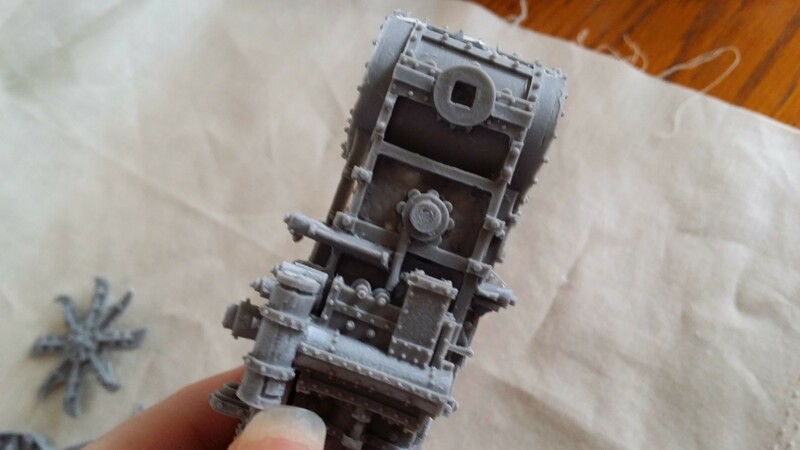 They can be next to each other or perpendicular from each other or at other angles, but any particular part of the model should have one mould line running around it, not two. 6. Peculiar packaging is another sign. 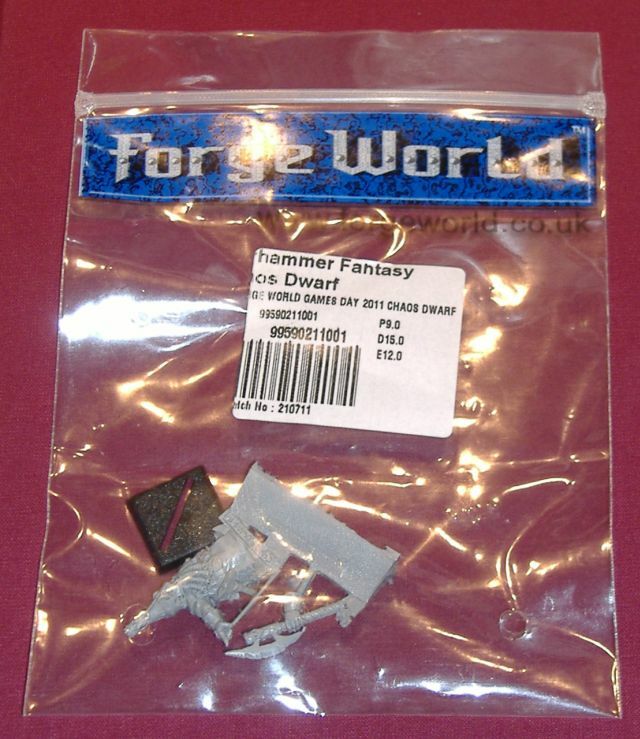 Here is true Forge World packaging. 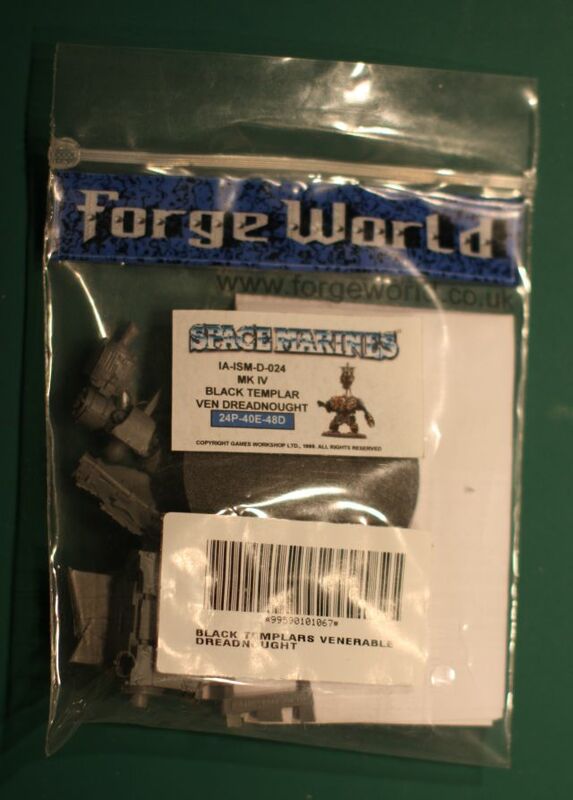 And here is the packaging of one particular set of “Forge World” recasts. Notice how there are ziploc bags inside the mostly unmarked manufacturer sealed bag and a stick on label with writing on it instead of the brand labeling. 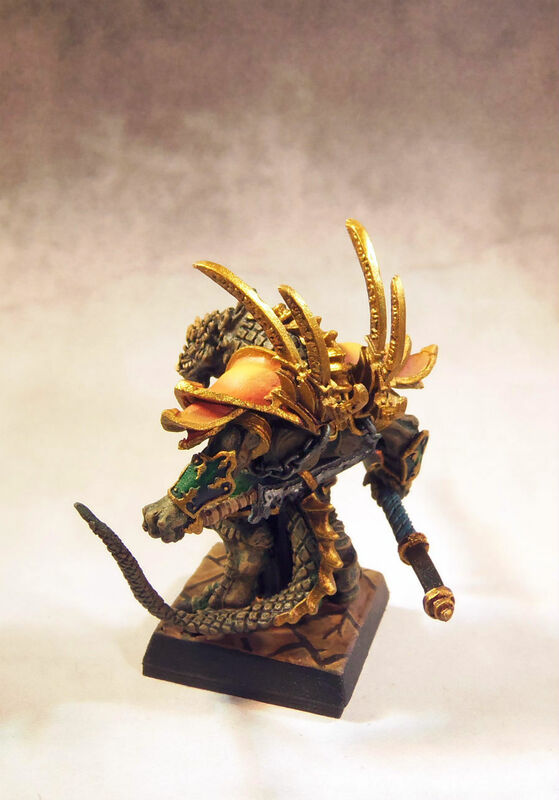 Ultimately, the only way for sure to tell if a model is truly Forge World or a recast is for Forge World to test the model. These signs are clues that there may be a problem. Please remember that it is illegal to even possess counterfeit (recast) models. It is illegal to recast for financial gain, as well as for your own personal use. It is illegal to sell or trade them. This violates intellectual property and copyright law. 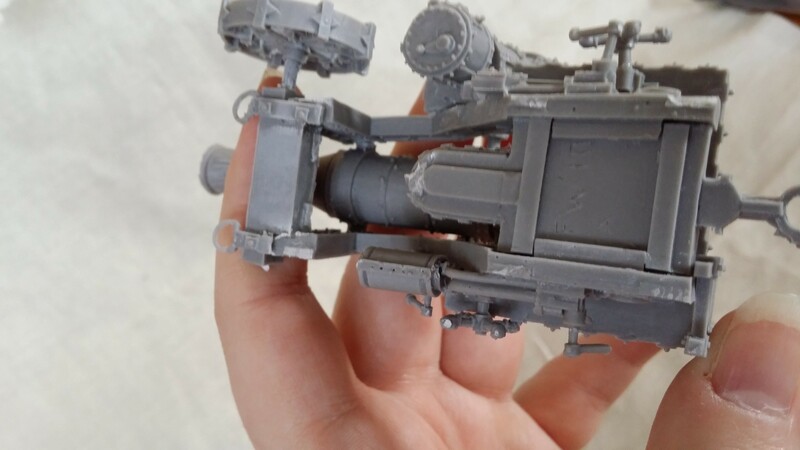 If you suspect you have counterfeit models, you should contact Forge World/Games Workshop legal. They will probably request pictures and contact info for whoever sold or traded them to you. 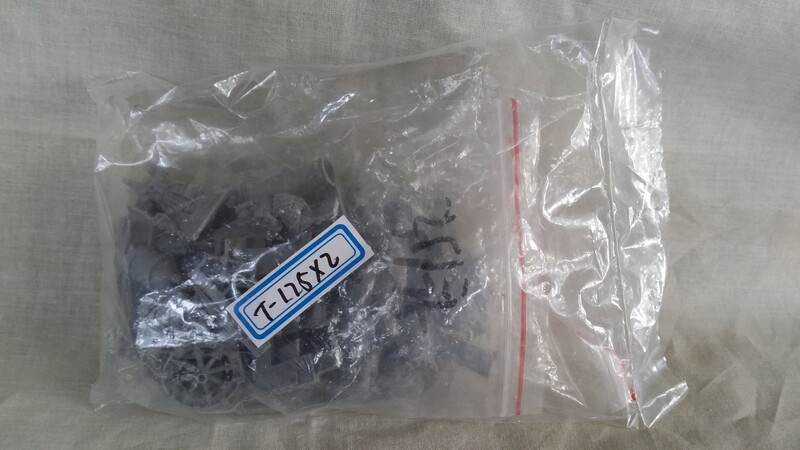 If you have unknowingly purchased counterfeit models on eBay or through PayPal, they may be able to help you with a case against the seller. They may also ask you to send them the models to be tested. 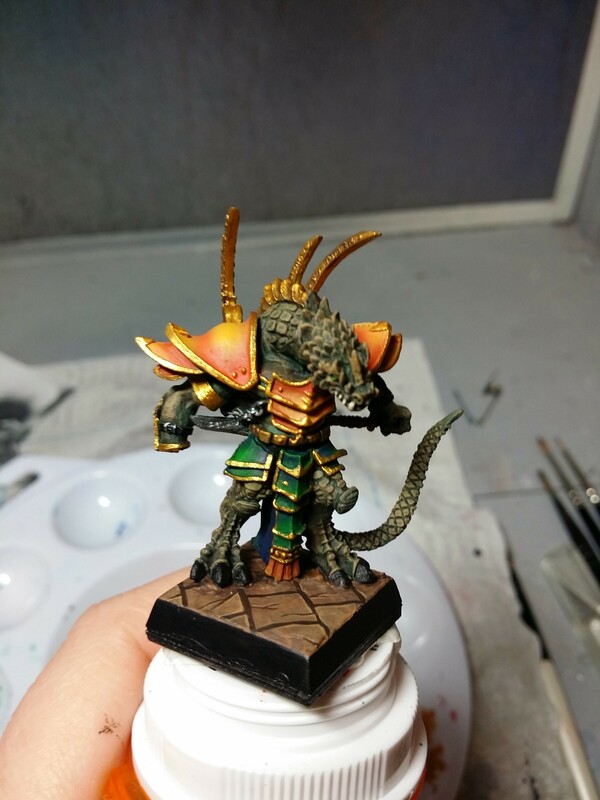 WIP: Games Workshop Lizardmen Skinks cont. 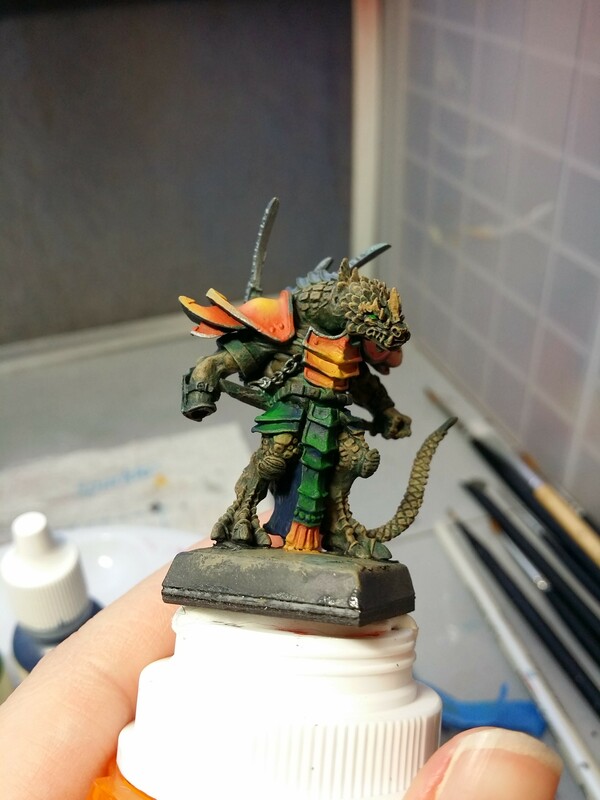 A lot of predatory, venomous reptiles have bright colors, often reds, so I decided that the Skinks needed red frills. I also took RMS Muddy Brown to all the wood and the bases. 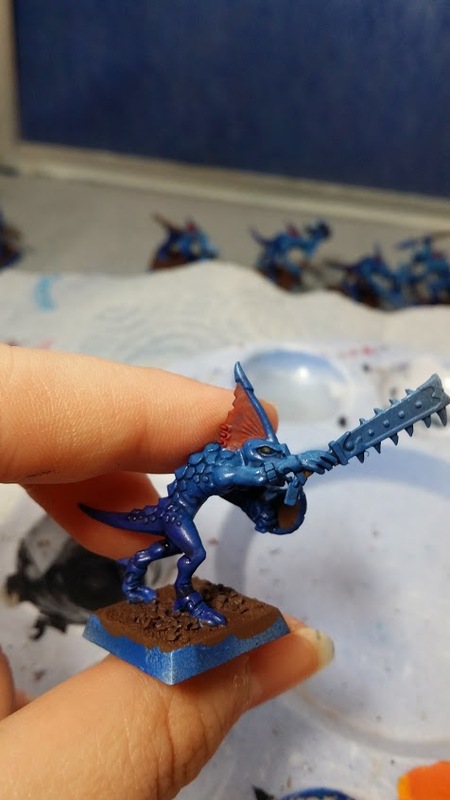 I decided I wanted the Skinks to be more than just basic blue, so I sprayed RMS Clear Purple on the back half of each skink. Then I sprayed RMS Surf Aqua on the front half mostly from above to highlight and tint the model. 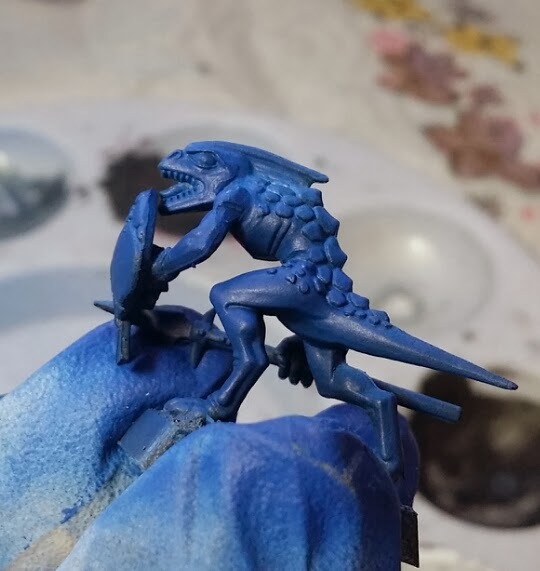 I also turned the PSI way down on the airbrush and put unthinned RMS Surf Aqua in so it wasn’t able to atomize properly. Then I sprayed the back half of each Skink so they had spots on the purple areas. This was mostly experimental…I’d never done that before, but I think it accomplished what I was after. If there is a better way, please, someone let me know! 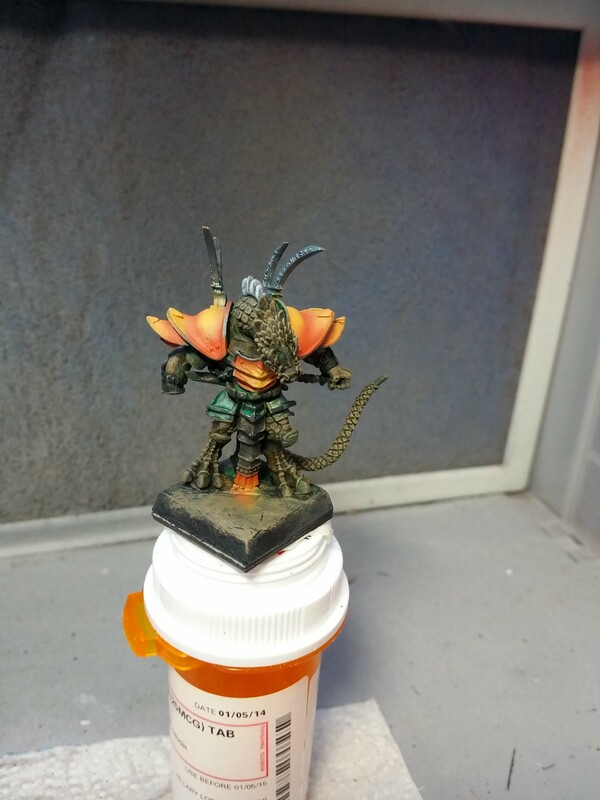 Well I’m finally able to start on the model I’m painting for Project Orange Crush – Convergence of Cyriss Mitigator. Lots of tiny bits, although Syntherion was worse! Then I got started on the mould lines, and boy were they bad! 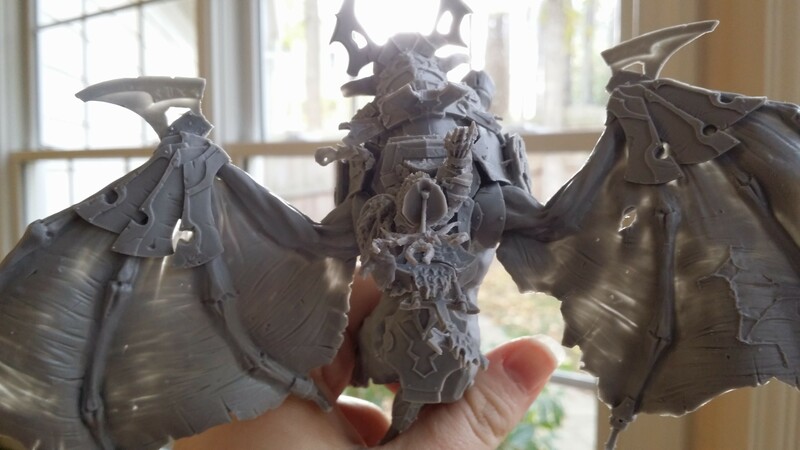 I’ve worked with a few Privateer Press models before that didn’t have nearly the mould lines this model did. 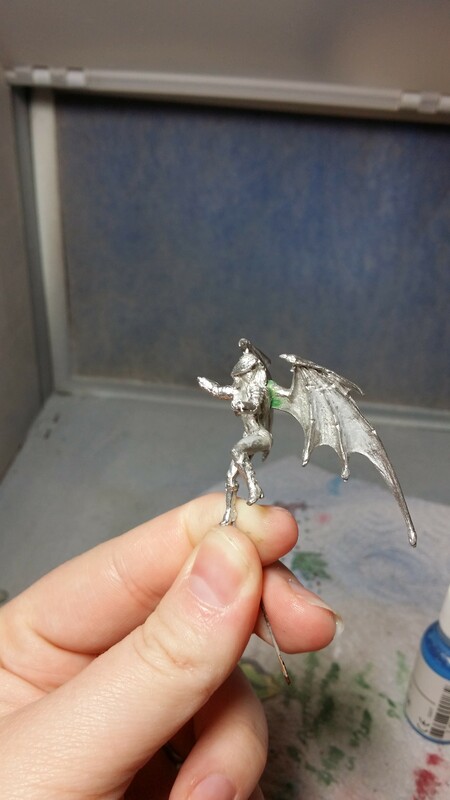 More mould line cleaning tomorrow, and then hopefully I can get it primed! I prefer to let the primer have at least 24 hours to cure before I apply paint, and I’d really like to get going on this project. All the waiting around is killing me!